I don't know about everyone else but i don't get on my computer very often i mostly use my mobile device even at home. that being said i want to suggest using the "Band" app for a more convenient way of hooking up for games, chatting on the go, announcing clan events, etc. Even though the Forum is "mobile friendly" it still isn't really that convenient and the notifications aren't that reliable on the go. the band app has alot of features that i think would be convenient for the clan considering it is designed for groups. 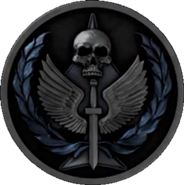 "Chat apps" have been discouraged in the past in this clan because it takes away from forum activity but this is more than a chat app and the forum would remain the "headquarters" for info and new recruits. but there already is NO chatting on the forum anyways. I think this would help the clan be more involved with each other. I'd be interested in looking into getting something more efficient for getting information out to the clan. Been pretty busy the past few weeks though preparing to start my new job though. In about a week of so I should have some more time to look a bit deeper into it. I would be interested in everyone else's opinion though. Thanks for the suggestion Paul! I'm not closed off on the idea. but I would highly recommend any events and SPECIAL announcements be here. getting together for game nights though is not a bad idea to use or if someone is going to be late night gaming or something.